My mom celebrated a big birthday number this weekend, so this is a little gift I whipped up for her. Really, its not a family tree–maybe more like a "tree of life" or something–all the people who love her and are part of her life as she turns the big 6-5. My siblings and their spouses are on each of the branches. And each branch gets a leaf for the children in that family. 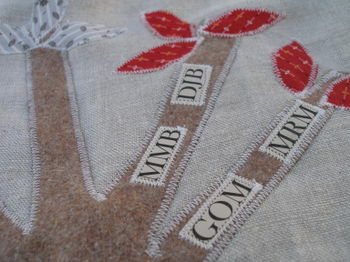 If I’d thought of this idea earlier than the day before we celebrated, I would have liked to have done the names in embroidery–but the flu and lack of time, caused me to have to go with paper and my sewing machine for the initials. And my oldest sister, who still lives at home with my mom, gets a little canary on her branch–just like the one she has at home…. Even with all my homemade gift glitches it was still a fun day with family. My sister made a yummy mushroom and artichoke heart soup and killer chocolate cake, and I kicked in some bread bowls and homemade rolls. and i love the tree!it is too cute…the fabric is adorable. This is such a sweet gift. A sweet and beautiful gift! so sweet! i did two loads last night, does that count? I too am reclaiming my house, it is an absolute disaster from our weekend. By Sunday night the mess was driving me nuts, but I decided to leave it until today. Backfired a bit as now I have one daughter at home sick. I love the Tree, how very creative. I bet your Mom will love it. Molly…I have a half-completed family tree sitting in my WIP pile. I love your version though. 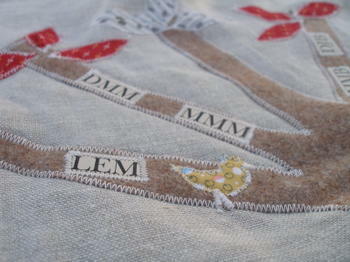 I was embroidering the names…which made me chuck it into the “pile”. =) What a sweet gift. That is a very lovely tree and a wonderful gift! I have many loads of laundry waiting for me at home. Sometimes I feel like I need to stop working.. just to do housework. Ugh. Look at all those Ms. What a sweet idea to commemorate a special day. That’s why no one likes mondays:)The problem I have is with working full time, there’s no one to do the reclaiming. I think I need to invent a self-reclaiming house…..
Mondays are my sacred day of recompense to the housecleaning deities. I get quite grumpy if I can’t stay home for a long stretch and recover from the weekend. This week as an added bonus, grandparents coming back from vacation and taking the kids, means Tuesday is an additional Monday. Silly things to get excited about. I love the idea of the family tree/tree of life. What a lovely present. This is a very beautiful idea. My mom would cry if I gave her something like this. this is wonderful. !i’ve had a similar idea brewing in my head for awhile now…..gift for my mom – perhaps i’ll sketch it out and actually make it for a next year’s holiday gift.thanks for the inspiration! This is such a great gift for a mom — so sweet! what a wonderful gift! I love it Molly, its perfect! You are so creative, I love that. I bet your mom loved her gift. Oh well, weekends are supposed to be fun. So enjoy them. I love your tree! 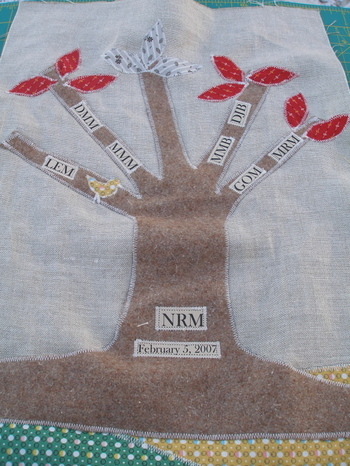 I should make something like that for my sister, who loves family trees. I’m certain your mum adored it. Previous Previous post: Did I really just say that?